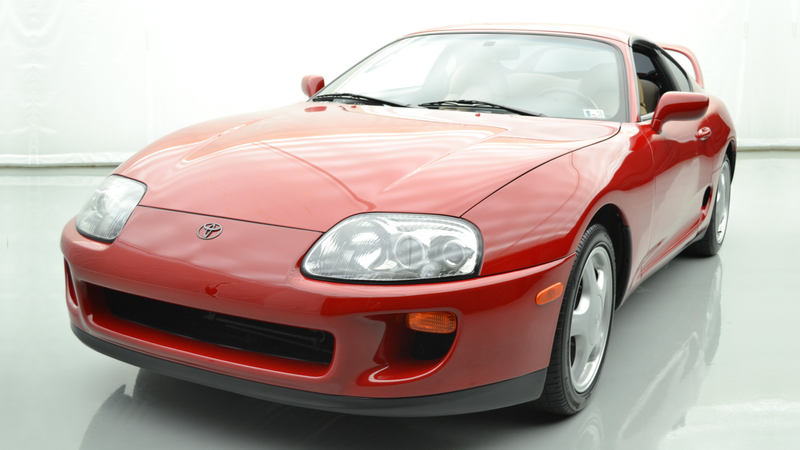 So, you thought a $121,000 auction price for that immaculate 1994 Toyota Supra on Bring a Trailer was a little much? Yeah, so did we. That was cute of all of us, because the car is now back up for sale by a Chicago dealership for $500,000. Well, it’s $500,000 flat or $7,902 per month for 60 months after a $100,000 downpayment. It’s your choice, really. Both options are enticing. It’s the same car, with about $400,000 tacked onto an already absurd sale price. Auction results from Bring a Trailer, where Supras go to sell for ridiculously high prices, show that the more expensive Supra auctions usually top out at around $60,000 to $80,000. An automatic 1994 Supra with less than 6,000 miles on it went for $80,500 last year. Then, there’s the little black dot that creeps just past the $120,000 line on the chart. That was this Supra, and it was already in a zip code of its own due to a six-figure bidding war between potential buyers. Chicago Northside Toyota is proud to announce a “”MARKET VALUE PRICING”” philosophy. We use real-time Internet price comparisons to constantly adjust prices to provide ALL BUYERS the “”BEST MARKET VALUE”” vehicle’s possible. [...] Remember we use “”MARKET VALUE PRICING”” to make it easier to not only buy a vehicle but to buy it at a GREAT price. Our pricing is HAGGLE FREE. We price them right and as a result it allows us to sell more for less. Our entire team is willing and able to help you. The dealership got at least one thing right here: This Supra will be haggle free, because, no matter how much Fast and Furious fame it has, a dealer that lists this car at $500,000 will never actually bring it down to a semi-logical price. But as Road & Track noted earlier today, the outrageous price isn’t to actually sell the car—it’s to get people into the dealership to see it. From there they can drum up excitement about the new 2020 Supra, or at the very least get you into a RAV4 or something. But hey, if anyone walks in with a cool half-mil and a lust for the old Supra, maybe they’ll have a shot.